If you come to the Big Island, you have to visit the Manta Rays. You just have to. The best and most exciting way to do this is by swimming with them. Other ways are to ride in a glass bottom boat or enjoy the restaurant lanai at the Sheraton in the evening. We've done all three. Even though we chose to visit the Big Island, because of the ability to snorkel with the mantas, we waited until our son and daughter-in-love could go with us in November. Waiting on the boat for others to arrive. For our manta snorkel, we chose a Sea Paradise because their tour leaves from Keauhou Bay arriving at the Sheraton in a whopping 10 minutes or less. I've been told that the airport typically has more mantas, but due to the threat of my wife getting sea sick, we preferred the shorter boat trip. All one needs is a mask, snorkel, and a short wetsuit, and all are provided by the tour operator for no additional charge. We checked in at their store front in Keauhou Shopping Center, signed all the waivers, and put on the wetsuits they loaned us. We chose to use our own mask and snorkel and not use fins. Once everyone has arrived at the boat, it is a very short ride to the mantas. When the boat is secured and the raft with lights was ready, we walk down the steps into the ocean. It is a short five yard swim, we grabbed hold of the raft, laid out flat, hung on, and waited. If you don't see mantas you're given a pass to return and try again. We began to wonder if we'd have to come back another night. We knew the mantas were in the area, because we could hear snorkelers squealing from a neighboring kayak tour. Still, it was a long wait, about thirty minutes in the water. It was an easy wait, with the wet suits and a provided swim noodle to keep our feet up, it was just a matter of floating and holding on to the raft to keep us from floating away. The time seemed to move slowly, even though we were occupied by watching the twenty or thirty fish and the plankton drawn to our lights. 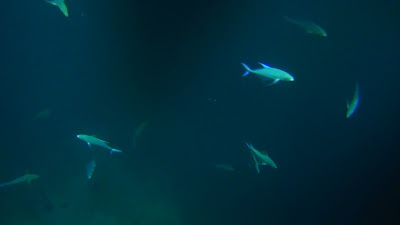 The 12 inch blue trevally provide a little entertainment. 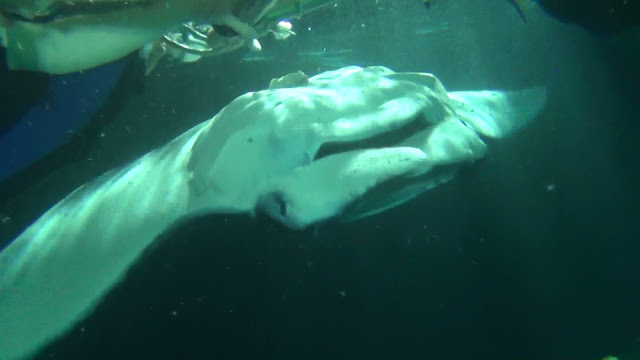 Then, out of the darkness, a huge manta gracefully curls underneath us. About ten feet below us, a barrel roll is started, moving up to within inches of our faces. Not 24 inches, not 12 inches, but 4 or 5 inches. Pass after pass, in and out of the light. Another Manta joins in, and then another. This was exciting; not scary. Snorkeler and Manta. Yes, that close! I had complete faith in these animals. There was an occasional brush or slight bump by a wing tip. All I could think about was wanting to touch them or make a quick dive following them down, but we'd been told not to do this. Mantas can't swim backwards, and we might get in their way. Touching them takes away the protective coating on their skin and makes them sick. 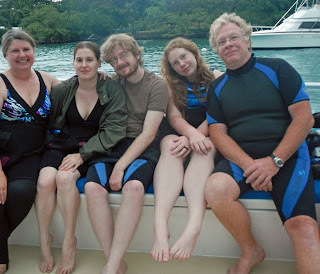 The snorkelers from another boat swam to our raft since we had the mantas. Their divers swam beneath us with three mantas sandwiched between us. Reef Manta approximately 12 feet wing tip to wing tip. This continued for about 45 minutes. The mantas seemed to get their fill of plankton, were tired of showing off, or were ready to check out the other tour boat for plankton, and so they swam away. We exited the water, all of us in awe of what we had just witnessed. 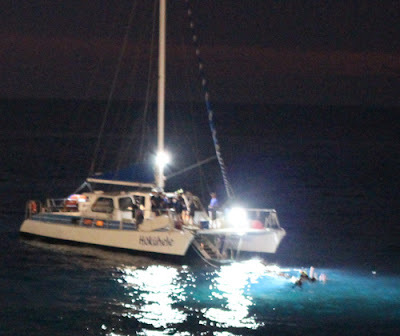 As the boat prepared to leave, the Mantas returned to the lights as if to say good bye. 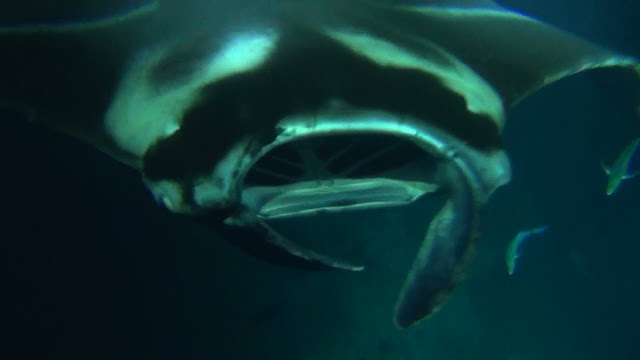 Watch the Manta Rays as they somersault closer and closer. 1. Even though many ads say that you don't have to have experience, don't do this as your first snorkeling adventure. You won't appreciate the mantas or snorkeling. 2. Check the wave and weather reports yourself, and wait until the surf was low and the winds were from the east. I don't recommend trying this during a period of Kona Winds or when there is a surf advisory or small boat advisory. 3. We chose a good evening, but I wasn't the only one who got sick in the water. Make sure if your susceptible that you take a motion sickness pill an hour before your tour, and wait to eat diner until after the manta snorkel. If I had it to do again. I would wait until everyone arrived before boarding the boat so I wouldn't have been on the boat as long. I would swim to the end of the raft furthest away from the boat, because the boats exhaust fumes added to the nausea. Also, see our first daytime swim with a reef manta in Hawaii.